Aloe vera is one of the potent medicinal plants to cure various diseases. Aloe vera is not an overstatement included in 10 best-selling herbs in the world. Perhaps, since the time of Cleopatra, the plant known as the Latin name Aloe barbadensis Milleer has been used to treat beauty. Ancient nations in the Arabic, Greek, Roman, India, and China, even using a potion made from aloe vera to treat a number of diseases like cough, abdominal complaints, and skin diseases. Some historical evidence that is then used as a reference in the present treatment. In the midst of the popularity of the benefits of aloe vera for skin care, plants grown since 1500 BC It also relied upon to facilitate the digestive system. Based on research by the Positive Health, and Aloebarbadiod Aloemoedin content in aloe vera helps clean toxins and waste that clogged in the digestive organs. If not cleaned the garbage food that can trigger the disorder in the stomach, such as diarrhea, or constipation, also inhibits the absorption of nutrients that the body needs. Nutrition in Aloe vera helps cleanse the digestive system from all sorts of poisons. American Chronicle reported, aloe vera also works as an antibacterial agent and fungus in the body so as to dispel a number of diseases. Enzymes are found in meat Aloe vera is also good for improving blood circulation. Aloe vera usually consumed in various processed forms such as juice, candy, or a mixture of tea. Nothing wrong with too creative with mix aloe vera into everyday cooking. Aloe vera plants form may indeed be simple and not interesting. But make no mistake, the aloe vera did have a lot of benefits. There are over 200 species of aloe vera plant (aloe vera), but actually only five species are considered beneficial to health or be used for beauty products, namely Aloe barbadensis Miller, Aloe Perryi Baker, Aloe Ferox, Aloe and Aloe Saponaria Arborescens. The older the plant aloe vera benefits to nutrition and medication. Aloe vera gel is often used to treat scratches, cut, insect bites and rashes. Benefits of aloe vera for health is already known since ancient times. According to historical records indicate the use of aloe vera for treatment of materials have been used since 1500 BC. Aloe vera is also suspected to be a beauty secret ingredient Cloepatra. 1 Aloe vera leaves are washed and peeled. It contained chopped or blended. Add 1 tablespoon of pure honey. Drink 3 times daily. Half (1 / 2) stem prickly aloe vera leaves removed, washed, and shredded. Give half (1 / 2) cup of hot water, then wring it out. Add 2 tablespoons of honey. In warmer conditions, drink 3 times a day. Half (1 / 2) stems from aloe vera leaves are washed and peeled. The content is cut into small pieces. Brewed with half (1 / 2) cup of water. Give 1 tablespoon honey. Warm food 2 times a day. 2 sticks of aloe vera leaves, washed, discarded needles, cut into pieces. Boil 3 cups water, then strain. Drink 3 times daily after meals, each with half a glass. 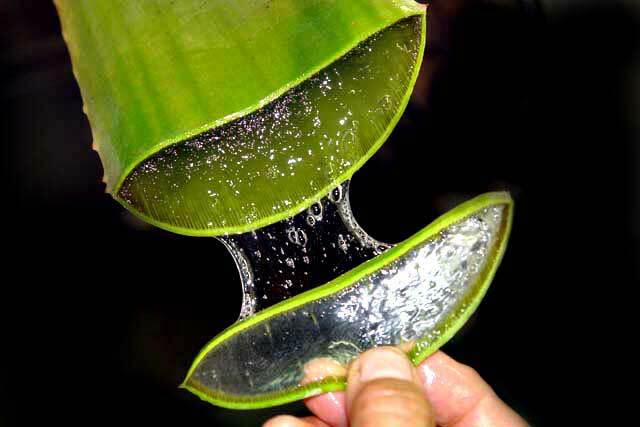 1 stem of aloe vera large size (about the size of your palm) is cleaned by peeling the skin and thorns. Soak about 30 minutes in salt water. Squeeze a while and then rinse under running water (tap water). Boil 3 cups water to boil. Chill. Drink as much as 1 / 2 cups, 2 to 3 times daily. 2 midrib aloe vera are washed and peeled. The contents rubbed on the scalp that had been washed in the afternoon. Wrap with cloth. The next day the hair is rinsed. Do it every day for 3 months. 20 g aloe vera leaves are washed, peeled, cut into pieces. Give 2 tablespoons of pure honey. Drink 2 times a day. Repeat for 10 days. Hopefully articles and potions for these diseases can be useful for you.